Mirrorless cameras tend to have smaller-than-film sensors and shorter than DSLR/SLR distances from lens mount to film plane. This combination makes them strong candidates for adapting existing interchangeable lenses from almost any 35mm mount. Virtually every system has the manufacturer providing at least one lens adapter for their mirrorless cameras (usually for their legacy DSLR/SLR lenses). Automatic features (focus, VR, etc.) aren't likely to work. 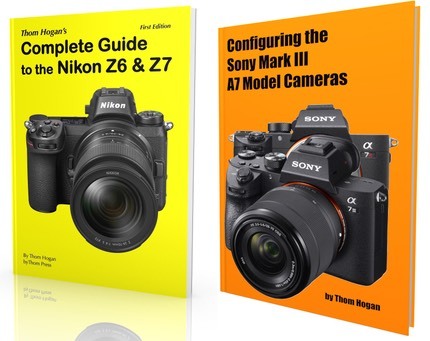 Exceptions: the Canon EOS adapter for the EOS M, the Sony Alpha mount adapter for the NEX, the Nikon FT1 F-mount adapter for the Nikon 1. You may be restricted to certain exposure modes (typically manual exposure mode) and features on the camera. You may have to set something on the camera (e.g. "Shoot without lens" setting on some models). Manual focus lenses are still manual focus. Some cameras have useful focus aids to help (magnification, peaking), while others have none. You have to be aware of the crop factor: a 50mm lens on most mirrorless cameras is a telephoto, not a normal lens. The lenses may be a lot bigger than the camera, especially since they were designed to be used on a deeper camera with a larger "sensor" area in the first place; the adapter sticks out from the front of the camera's lens mount, too. Not all older lenses perform great on newer digital cameras. Some lenses may need special correction. The Fujifilm X cameras with Leica M-mount lenses are a good example. Fortunately, Fujifilm built correction features into the most recent cameras and a way to trigger them quickly from the adapter itself. m4/3 -- The m4/3 mount is amongst the most flexible, as we have not only Panasonic and Olympus providing sets of adapters for various lenses, but we also have Novoflex, Voigtlander, and others providing adapters for virtually any lens mount out there. Even C mount lenses have been successfully adapted to m4/3 (though primarily those designed for 16mm movie cameras and 1"+ sensors). All of the Panasonic and Olympus models will work with an adapter out front, though you may have to select something in the menu system to allow the camera to operate without an automated lens out front. Light falloff can be pronounced (especially C mount and Leica S/M mount lenses, and especially wide angle), but some people like that vignetting effect. Both Panasonic and Olympus cameras have some basic manual focus aids that are helpful, though none that are as helpful as what Sony has provided (customizable peaking), in my experience. The 2x crop of the m4/3 bodies means that wide angle options aren't especially abundant or useful. Even a 15mm Leica lens becomes the equivalent of 30mm on the m4/3 bodies. (That's one reason why some have explored the C mount lenses, where we can find 6, 7, 8mm focal lengths that would be really wide on m4/3.) Frankly, I'm less inclined to use adapted lenses on my m4/3 cameras these days because we have over two dozen very good m4/3 lens options these days. The hassle of adapted lenses (typically manual focus, more trial and error exposure setting, crop factor, size of the lenses) just doesn't appeal to me when we now have two full sets of zooms and a full set of small primes available. I tend to dip into adapted lenses on m4/3 only when something isn't available in the m4/3 mount. That currently means mostly fast telephotos. There, it makes some sense to look at some of the wickedly sharp, fast, Olympus Four Thirds telephotos using an adapter. Make sure that the lens you're interested in autofocuses with the m4/3 adapter, though. Not all do. Nikon 1 -- The CX mount is derived from the Nikon F mount. Thus, it's no surprise that Nikon brought an F mount adapter to the market. Unfortunately, the 2.7x crop factor of the Nikon 1 sensor means that the FT1 adapter (and any other adapters that appear) is most interesting to people seeking telephoto options. For example, the Nikkor 70-200mm f/2.8, a highly regarded and very capable DSLR lens, becomes the angle of view equivalent of a 190-540mm on a Nikon 1 body. With the FT1 adapter, the lens still autofocuses and supports VR, thus the combination becomes a poor man's safari rig (if a US$2000 lens can be termed "poor man's"). Things become less interesting if the lens you want to adapt is not AF-S: autofocusing won't work. And if the lens isn't chipped (D, P, or G types in the Nikon F-mount world), automatic exposure control is lost and you have to shoot by trial and error in manual exposure mode. Note that there are some restrictions with the FT1, most notably center only focus and no continuous autofocus. The first isn't a big bummer, but the latter tends to be for some. Personally, I've adjusted. The V2 with a 70-300mm VR lens makes for the most inexpensive, hand-holdable, and highly usable 810mm option on the market today. Finally, C mount lenses designed for 16mm or 1" video should work fine via a third party adapter on the Nikon 1 (though you'll be manually focusing with very little help from the camera, and setting exposure manually). Note that Nikon 1 cameras have almost no focus aids for manual focusing, just a zoomed view of the central area. Samsung NX -- I'll have to admit I haven't really experimented with adapted lenses on my Samsung cameras yet. I'll hold my comments until I have. Sony NEX -- Like Nikon, Sony has supplied an adapter that supports its legacy lenses. Actually, two adapters. The first (LA-EA1 and LA-EA3) is just a basic automatic adapter. In my experience, the Alpha mount autofocus primes I've tried with it perform decently in terms of focus speed for acquisition, poorly for tracking. The second (LA-EA2 and LA-EA4) includes a phase detect autofocus system and gives near Alpha DSLR performance at the expense of very high battery consumption. If you've got Sony Alpha lenses, you'll probably want one of those adapters. The downside is that these lenses, with adapter, will definitely drawf the camera body, especially with the E-mount cameras. You'll be holding "all lens." The Sony also adapts reasonably well for Leica S/M-mount lenses with third party adapters, though the NEX-7 often tends to show corner issues with wide angles that need post processing correction. The 1.5x crop isn't a killer, meaning my Voigtlander 12mm has an angle of view like an 18mm on film. Still very wide, just not killer wide. Sony's "peaking" method of verifying manual focus also works very well, better than all the other aids I've seen on the other cameras to date. Coupled with the tilting LCD or EVF on the higher end models, you can frame, focus, and expose with manual focus lenses pretty darned fast, even for street photography. The FE-mount Sonys (A7 series) also work pretty well with most film camera lenses with the right adapter. Fujifilm X-Pro1 and X-E1 — Fujifilm's M-mount adapter allows you to mount a number of M-mount lenses on the camera. Not all lenses are compatible (see Fujifilm's Compatibility List). But those that are can be corrected for distortion, vignetting, and side-to-side color shift. You'll be focusing these lenses manually, so pay attention to and learn the camera's manual focus capabilities. Frankly, the Fujifilm M-mount adapter has proven to be the best way to use Leica M mount lenses outside a Leica. Yeah, that good. The only real issue is that you've got a 1.5x angle of view factor due to the APS sensor in the X models. This means that there aren't a lot of great truly wide angle options if you go this route. I have a lot of Voigtlander M-mount lenses, and they've all proven to be excellent on the X-Pro1. Canon EOS M — Canon, like Nikon and Sony, has an all-automatic mount adapter for their DSLR lenses. It supports autofocus, exposure automation, and image stabilization with any EF or EF-S lens. That's the good news. The bad news is that the EOS M's autofocus system is slow even with its own lenses. If you expect DSLR-level experience with the adapter and your DSLR lenses, you'll be disappointed. The underlying question is this: is it worth it to go the adapter route? Technically, not usually. Funwise, absolutely. With perhaps the exception of the manufacturer legacy telephotos (4/3 to m4/3, FX/DX to CX, Alpha to E/FE-mount, EF/EF-S mount to EOS M), the primary compelling issue for most people is that they already have some lenses sitting around and they want to see how they perform on their new camera. Great. That can provide endless fun. Technically I don't think it's worth it for anything other than fun and slow shooting, though. Some think that used legacy manual focus lenses are inexpensive enough to warrant trying out. I don't dispute that, but the lack of automation makes these much more useful for slow or structured shooting, and I'm not 100% convinced that the image quality gains (if any) are worth the hassle. The one exception I’d make to this is the Fujifilm X-Pro1, X-E1, X-E2, and X-T1 with Leica M-mount lenses. The Fujifilm cameras are slow, deliberate cameras and manual focus fits with its typical user profile. That, plus the fact that Fujifilm spent time figuring out optical corrections for all the Leica lenses is a real plus. Another usually stated reason is "to provide an option that doesn't exist in the current system" (sometimes in conjunction with the "inexpensive" point). Typically, this means fast aperture, as all the systems now have the basics covered reasonably well. In m4/3, we now have a reasonable set of fast primes and zooms, so I don't judge that m4/3 users really will be able to use this justification for long, if at all. On a Canon EOS M, Samsung NX or Sony NEX, that justification still applies, though. On a Nikon 1, the severe crop factor makes it only interesting for telephoto work. If you already have some lenses in another mount, the cost of playing with them on your new mirrorless camera isn't terribly high. I've seen adapters anywhere from US$20 (basic C mount for m4/3) to US$350 (sophisticated manufacturer provided legacy adapter). So, for the price of a low-cost lens, you can use your existing lens, which is why so many people are doing it. One other issue often comes up with legacy lenses: automation. If you go far enough back into your lens closet, you're probably got manual focus lenses that pre-date all the exposure and focus communication that is in modern lenses. When you use such lenses on an adapter, you often end up very restricted in what you can do (manual exposure mode, need to set "shoot without lens" option, no focus confirmation, etc.). There is a solution. Back in the old days of Nikondom, Nikon used to sell parts. One aspiring person figured out that you could take one of the so called "CPUs" from a modern lens and retrofit it to a legacy lens. In other words, you could order an appropriate part from Nikon and install it into your older lens. Eventually that spawned a small, almost invisible third-party solution or two: the Letus and Dandelion chips. You can get those for Nikon and Canon lenses, and you can now get the Dandelion chip for m4/3 and Olympus lenses. These chips, properly installed, can be used to fool the camera into thinking that they're dealing with a modern lens, and thus leave all exposure and focus controls intact. That doesn't mean you can suddenly autofocus with a manual focus lens, but it does mean that the focus confirmation (if present) will work. Finally, the emergence of the Metabones Speed Booster type of adapter changed the scene a bit. The Speed Booster is not just an adapter, but an adapter with optics that attempt to correct the crop factor. In doing so, they also increase the effective aperture by a stop and increase the overall sharpness of the adapted lens. Frankly, if you’re interested in using adapters, I’d tend to recommend the Speed Booster approach, even though its more expensive than a plain tube with electronics. The optics in the Speed Booster were designed by one of the best optical designers in the US, and the results really show. While there are now Speed Booster clones coming out of China, none I’ve seen come close to the level of quality the Metabones originals produce.